Trace: » Goessmann, Helena T.
Helena T. Goessmann was hired as an assistant in English at the Massachusetts Agricultural College in 1910, making her perhaps the college's first woman member of the faculty. Born in Syracuse, N.Y., on September 21, 1863, the daughter of the distinguished agricultural chemist and long-time member of the faculty at Massachusetts Agricultural College, Charles A. Goessmann and his wife Mary Anna (Clara), Helena Goessmann was raised in an academic household in an academic community. A graduate of Amherst High School and Sacred Heart College in Providence, R.I., she received an M.Ph. at Ohio State in 1895, after which she rounded out her education with study and travel in London, Paris, and Munich in 1899-1900. For most her life, she lived with her parents and unmarried sister Mary at 40 Amity Street in Amherst. A lively mind, Goessmann became deeply involved in the Catholic educational movement of the mid-1890s, contributing as a writer and traveling lecturer. 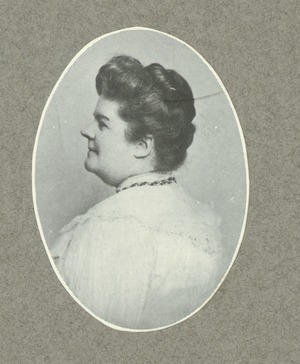 She was instrumental in establishing the Catholic Summer School of America at Cliff Haven, lecturing there in 1893, 1893, and 1903, as well as at the Winter School in New Orleans. From 1897-1899, Goessmann served as head of the Department of History at Notre Dame College in Baltimore. Several scholarly articles of hers appeared in Catholic publications during the decade, and she was author of The Christian Woman in Philanthropy: A Study of Past and Present (1895), a novella Brother Phillip, and a book of poetry, A Score of Songs. Through her family, if nothing else, Goessmann already known on campus prior to joining the faculty, both by students and the administration. In 1896, she was listed as patroness of the Senior Promenade and Military Ball. At the time of her father's death in 1910, Goessmann was hired as an Assistant in English at MAC, earning promotion to Instructor in 1914. She remained in that position under her death during the summer of 1926 after a period of ill health. Skinner, Edna, “Helena T. Goessmann,” Index (1928), p.17.